Lieutenant Neil Sinclair, 30 years BF (Before Flashpoint) agrees to participate in what is a Captain America-style super soldier experiment under the direction of General Sam Lane. 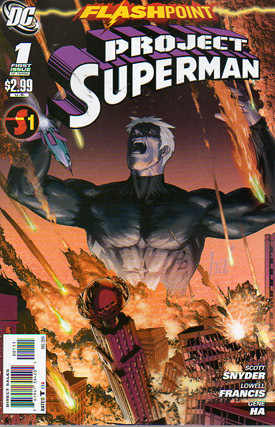 Eventually, Sinclair begins to develop powers above and beyond what was expected, a power set very similar to Superman. He keeps that to himself. In isolation, we start to see him fray at the edges, becoming power hungry. Sinclair starts to go rogue, disobeying orders. He is caught and locked down in a vault. The spaceship carrying baby Kal-El crashes in Metropolis. General Lane's wife goes into labor. Story - 3: Interesting initial idea. They clearly want to show the differences between Kal-El growing up with a nurturing family and Sinclair shunning humanity. So while the Kal-El we all know grows up with stellar values, Sinclair loses his ability to connect. There is one central problem that blights this book, though. Unfortunately, Sinclair just isn't a terribly memorable character. As a reader I didn't care about him one way or the other. I was just waiting for some indication the real Superman might turn up at some point. Luckily, even though it is on the very last page, the rocket ship piques my interest for what is to come. As with many of the first of three tie-ins, this book needs to go through the motions of setting up the next two. This one only just gets away with it. Art - 4: I really enjoyed the art in this. Gene Ha's sketchy work nods to Manga and Pop Art while retaining a clear identity of it's own. The scene of the meteorites crashing into Metropolis is fantastic. Cover Art - 4: We see Sinclair looming over Metropolis as the meteors hit. It brought King Kong to my mind. We see Kal-El's rocket ship heading towards Sinclair's chest. Excellent.